The CBSE kho–kho cluster XVI tournament-2018 concluded at Guru Nanak Model School on Monday. In U-17 girls’ category, Shri Guru Harkrishan Public School, Kapurthala, defeated St Soldier Divine School, Bhogpur, to clinch the first position. In U-17 boys’ category, Guru Nanak Model Senior Secondary School, Doraha, won from Swami Sant Dass Public School, Phagwara. 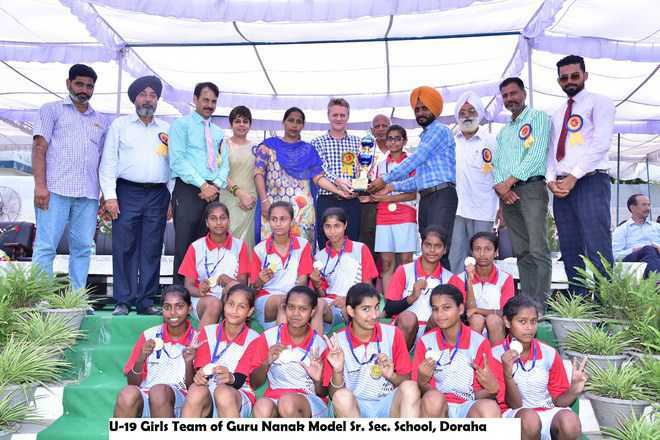 In U-19 girls’ category, Guru Nanak Model School, Doraha, stood first after defeating DPS, Parowal. In U-19 boys’ category, Guru Nanak Model Senior Secondary School, Doraha, thrashed DPS, Parowal. The winners were felicitated with medals and trophies. All the players were awarded participation certificates. John Gloster, chief quality officer, at KOOH Sports and physiotherapist of the Indian cricket team (2004 to 2006) was the chief guest. Golster appreciated the efforts of school administration for providing students sports literacy along with academics which would encourage kids to explore their talent. “As I have observed the athletes playing, I am simply awestruck by their commitment, tenacity, passion and feeling which is no less than that found in world class athletes. If such is the pace and manner with which the rural talent is being explored and polished and that too in such a small town of Doraha, I must salute the organisers,” he added. Jogeshwar Singh Mangat, senior vice-president, Adarshpal Bector, manager, Pavittarpal Singh Pangli, Roopinder Kaur Brar, Ravinder Singh, Navneet Singh and other committee members were also present on the occasion. Boys and Girls of Guru Nanak Model Senior Secondary School, Doraha, left the audience awestruck with their bhangra performance.